In 2012, The Center for Tomorrow’s Leaders and McKinley High School began their partnership to teach a leadership development course to promising young leaders as part of the new CTL Schools program. Since then, the student leaders, referred to as Ambassadors, have been channeling their leadership into projects that can make a difference in their community. In 2013, Ambassadors from the McKinley High School CTL school program created The Lokahi Project, whose main ambition was to provide support for the senior citizens in the community. Over the past two years, The Lokahi Project has planned two major events for the senior citizens, starting off with a Senior Prom and following up with a Senior Luau. 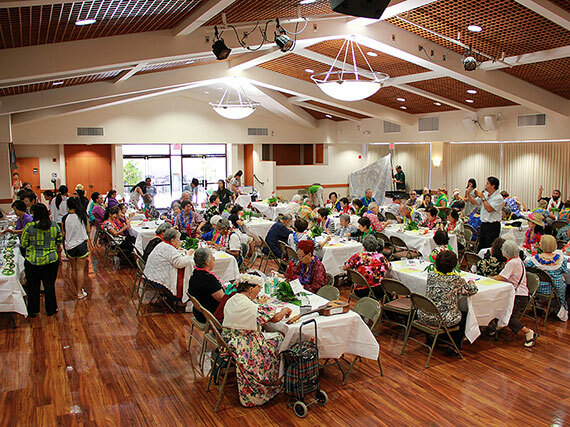 At these events, the students provided a fun, engaging environment in which the elderly were able to celebrate with one another while also building a stronger community between the students and kupuna. On its second year, this project was led by Samantha Cadiente, Leilani Ly, Tianna Phan, Angelika Santiago, Alexander Wong, Jenny Zheng, Marissa Minami, Danny Canales, and Passina Abe. We interviewed this team to learn more about their experience with The Lokahi Project. Can you please give us general information about your project? The Lokahi Project was created in order to raise awareness of the increasing percent of depression in senior citizens in the community, help build friendships among senior citizens, and give back to our elders. Every person in our group also had a strong personal passion for this project because of experiences with the senior citizens in our lives, so in a sense, it was very personal for us. Can you explain the meaning of the name Lokahi Project? Lokahi when translated to English means ‘to unite’ and ‘to unify’. So, when trying to think of a name for our project, we believed Lokahi was the perfect fit for our vision. What is the vision of this project? By building relationships between student and senior citizens, we can bridge the gaps not only amongst seniors themselves, but between generations, thus reducing their loneliness and empowering senior citizens to be more social. What are some of the accomplishments your team is most proud of? Our project has gained more publicity coming back for its second year. We have garnered partnership offers from both the Hawaii Center for Aging, Kahala Nui Senior Care, and Hawaii Meals on Wheels. We were also mentioned in the Midweek through a letter to the editor from one of the attendees of the Senior Prom. Most importantly, The Lokahi Project has been able to successfully build new relationships with the senior citizens of Kulana Hale. The friendship made between our volunteers and the residents and between the residents themselves is perhaps our greatest accomplishment of all. How did you go about planning the Senior Prom and Senior Luau? Were you able to use any of the leadership skills you learned in the McKinley High School schools program? Planning the Senior Prom and Senior Luau were in no way at all easy tasks. First, we met and discussed all the things we wanted to have for the seniors to enjoy while they were there, including decorations, theming, food, and entertainment. Once we were all on the same page, we began reaching out to possible sponsors, organizations, and individuals who might be able to assist us. We also began looking for possible locations to hold the event and asked for volunteers. After this was all organized, we began putting everything together, and finalized the week before the event. The day before, we went to our location, the Catholic Charities Banquet Hall, to set up early so we could minimize our stress the morning of. The public speaking, organizational, and social skills we learned through the schools program helped us through many situations. But ultimately, it was the persistence and willingness to help from all of our group members that got the job done. Why do you think it is important to care for our community's kupuna? Our Kupuna and senior community are comprised of people who have done so much to ensure that our current generation knows what to do, and what not to do. They are our greatest teachers, and wisest leaders. To not care for them now, when they need us the most and after they have sacrificed so much for us, would be the world's greatest injustice. What was the most meaningful experience of your project? The most meaningful experience of our project is getting to know many of the kupuna in our community on a personal level and realizing that although there is a different in age between us, we really are not that different. We both love to laugh, have fun and, of course, win things! It was also very special for us to be able to see the happiness and improvement in quality of life of the seniors we worked with. Being able to see them smile, and seeing kids from our generation smiling along with them was the culmination of everything we had worked for. What was the most difficult part of planning these events? The most difficult part of planning these events was managing our time. We are all students first, so we each have school work and extra curricular activities on our plate. Therefore, when planning for our weekly visits to our monthly activities at Kulana Hale and on top of that the Senior Luau, we hit some rough patches, but thankfully we pulled through and the event was a success. Now that you are all officially alumni of the Center for Tomorrow's Leaders, what are your next steps for your project? Now that we are all alumni of McKinley High School and CTL, we will pass The Lokahi Project down to the next group of passionate Ambassadors, just as we were given the torch from the original Lokahi members. Next year, the project will rest in the hands of Leilani Ly, an upcoming McKinley Junior who has the skills, work ethic, and passion to take this project to new heights. The Lohaki Project team would like to thank Kulana Hale for allowing them to host monthly events as well as weekly hangouts for the kupuna that live in the complex, Aloha United Way and Kahala Nui for their generous sponsorships, Catholic Charities for allowing them the use of their facilities for our Prom and Luau, Ishikawa Photography for donating their time and allowing the senior citizens to take pictures, Meadow Gold Dairies for donating desserts, Tony Silva and Pipa for emceeing their events, and Highway Inn for the ono Hawaiian food. They would also like to give a huge mahalo to Ms. April Nakamura and Ms. Katie Chang for their guidance and teachings throughout the years of being a part of Center for Tomorrow’s Leaders, their student volunteers and student performers. Lastly, they would like to thank the original members of the Lokahi Project, who blazed the trail for all future members of the project and set a strong foundation for the years to come.